These apps are life-changing and make college at Illinois State a lot easier. There are plenty of apps out there that can make your life easier. Here’s a list of my five can’t-live-without apps. I don’t like to throw around the phrase “life changing,” but … well, you’ll see. The Vidette is Illinois State’s newspaper. What TV shows are Redbirds raving about? Did Illinois State win the football game? What’s new in Bloomington-Normal? You’ll always be in the know with The Vidette app. Quizlet is both a website and an app that lets you create flashcards. I love it because I can type my notecards on my computer, and then study on the go. You can even share decks of flashcards with your friends in the class, so win-win, right? On the topic of studying, why not just take notes on your phone? Microsoft OneNote lets you do just that. Even better, you can download Office 365 (including OneNote) to your computer for free if you’re an Illinois State student, and your notes will sync between devices. You’ve probably heard the phrase “broke college student,” and who doesn’t love a good coupon? Flipp Coupon allows you to find coupons for stores that are close to you. 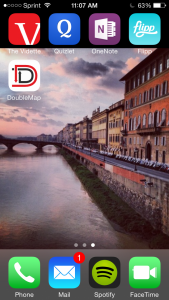 Double Map is an app that can help you navigate the Connect Transit buses in Bloomington-Normal. They’re super easy to use, but this app shows you routes and schedules that makes getting around town that much easier. Like I said, these apps are life-changing and make college at Illinois State a lot easier. If you download these apps, I promise that your phone will help you instead of just distracting you. #BirdofMouth student blogger Dillon Maher is a sophomore public relations major. Read more #BirdofMouth posts.